Volkswagen’s EV onslaught, Carlos Ghosn messiness, General Motors’ Mexican production and more await you in The Morning Shift for Friday, Dec. 7, 2018. 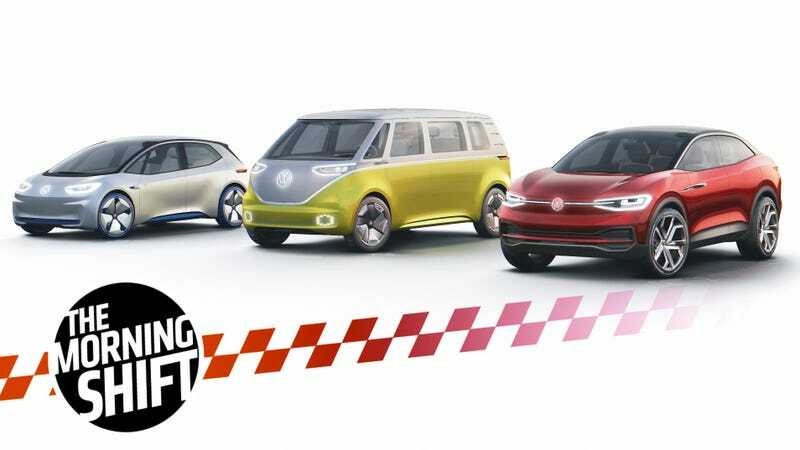 Volkswagen seems like it’s fully committed to unleashing a massive number of electric vehicles. And it should be, considering the Dieselgate mess is still fresh in consumers’ minds. Today, the automaker said that it can build 15 million electric cars with its new MEB platform, according to Reuters. The company is investing over $12.5 billion into electrification and autonomy by 2023. Over $10 billion of that will go towards building a whole new line of electric cars. That MEB platform could supposedly underpin a four-door, four-wheel drive electric Beetle, the rebirth of its Microbus as an electric cargo van or as the I.D. Buzz as part of the new electrified I.D. family. These cars, when they are unveiled, will apparently be priced similarly to VW’s old diesel cars. There’s no point in all these fancy electric cars if nobody can afford them, so hopefully the pricing will be appropriate. Anyway, yesterday’s Morning Shift reported that VW is also cutting costs by some $3.4 billion in anticipation to the shift to electrification. A brand-new platform and 15 million cars is a hefty endeavor! Let’s see if VW can pull it off. Last month, Nissan chairman Carlos Ghosn was arrested over alleged financial misconduct, where he was claimed to have under-reported almost $90 million in compensation and put other company funds toward personal use. Now, another, separate allegation has arisen. The latest revelation is one of a number of purported attempts by Ghosn to award himself lucrative post-retirement compensation. It’s separate from the allegation that he failed to report eight years of deferred pay, which also amounted to about 9 billion yen, the people said, or a 4.7 billion yen share-price-linked plan, called stock appreciation rights, that he planned to receive after retirement. Another nine billion yen ($80 million) payout! Ghosn has denied wrongdoing when faced with these claims. The long-term incentive plan, according to Bloomberg, was canceled in January 2017. Expiration of the stock appreciation rights would have happened next March, said people familiar with the matter. It’s been three weeks since Ghosn was arrested at a Tokyo airport. Since then, Japanese authorities have said that they will hold in him jail for an extra 10 days where, as the Wall Street Journal reported, they can interrogate him without court approval. Formal charges are expected to come on Monday. Carlos Ghosn is set to be indicted for financial crimes as soon as Monday, according to people familiar with the matter. Prosecutors are also planning to re-arrest Ghosn on new charges not yet made public, said the people, asking not to be identified because the information is private. In the first sign of blowback from the scandal for Nissan Motor Co., the carmaker is also set to be indicted for breaching Japan’s financial instruments and exchange act by making false statements on securities reports, the Nikkei newspaper reported. Former representative director Greg Kelly, who is accused of aiding Ghosn in understating his income and misusing Nissan assets, is also set to be indicted, Nikkei said. Looks like Nissan is inevitably going to get dragged into this as well. Bummer. Bloomberg outlined the potential legal process following the indictment: Ghosn stays in custody as prosecutors continue their investigation, Ghosn is tried 40 to 50 days after the indictment, Ghosn can appeal the verdict twice and, if convicted, he could face up to 10 years in prison. Guess we’ll find out Monday. In addition to saying that GM would keep an “open mind” about what will happen to people currently working at the GM Ohio plant that is slated to close, General Motors CEO Mary Barra also said that there’s an “overcapacity across the country,” according to Reuters. In other words, people should probably start looking for jobs elsewhere. “I want to make sure that the workforce knows that there are limitations and we do have an overcapacity across the country,” Barra said, urging workers at plants set to close to take seriously offers of GM jobs in other parts of the countries. In a brief Reuters interview after her meetings Wednesday, she said it would be “very costly” to shift production from Mexico of the Chevrolet Blazer due to be launched in the next few days. So, the Chevy Blazer’s production isn’t coming here from Mexico. I’m no business expert, but if zero Mexican production winds up coming stateside, you won’t see me surprised. I didn’t realize this, but apparently no Chinese brand has been successful in bringing cars to Western Europe. But, as a bunch of Chinese automakers are rolling out electric vehicles, that might soon change. a four-seat small sedan, which will be marketed under the company’s Ora EV brand. The Ora R1 electric car was designed to meet European standards for city commuting. With a range of up to 350 kilometers (217 miles), it will go on sale in China on Dec. 18 with a starting price of 61,800 yuan ($8,970) after government subsidies. In addition to Great Wall, companies like Bordrin Motor, Thunder Power and SAIC Motor have either started talks with European dealers about selling their cars or signed agreements with a local government to build an assembly plant. Western Europe seems like the next best place for China to start sending its electric cars, as many city centers have discussed banning emissions-producing cars in the near future. Neutral: Would You Buy an Electric Car From China? Hopefully more electric cars will come here soon, because more choices for the consumer is always better. And they are better for the environment.